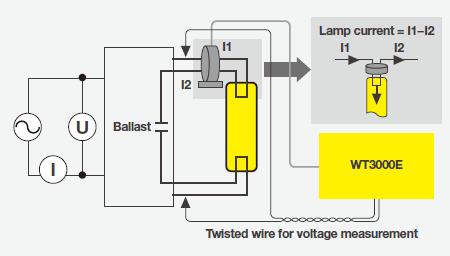 Testing of high frequency lighting devices often involves measurement of voltage, current, and Total Harmonic Distortion (THD), a parameter that indicates the quality of power. This is because distortion in voltage and current waveforms is becoming more prevalent due to the increasing complexity of control systems. 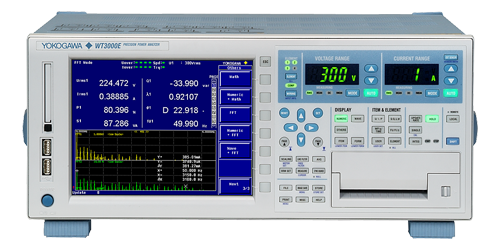 The WT3000E can simultaneously measure voltage and current with THD, and allows for more accurate and rapid measurements of an instrument’s characteristics and fluctuations. Currently LEDs are rapidly replacing incandescent light bulbs and compact fluorescents (CFLs). The main reason is because LED lighting is more energy efficient. In case of LED lighting systems it is important to measure small DC currents and the dimmer control circuit needs high frequency measurement capability. Both 2 A and 30 A input elements can be installed in the same WT3000E and provides up to 1 MHz broadband performance. Thus users are able to fully evaluate their LED systems.